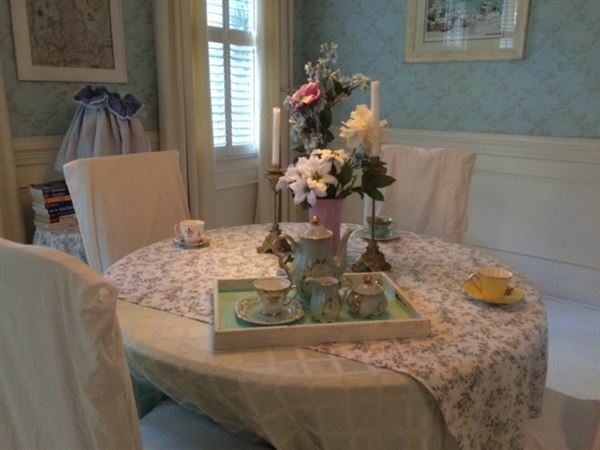 I have a beautiful downtown historic home decorated in pastels with lots of tiffany blue and French/New Orleans inspired decor. It's like a real life dollhouse!! I've had several different groups use it for wedding related events, particularly bridal showers, baby showers and girls/women's birthday parties! There is surround sound for your i phone or computer, a full gourmet kitchen and ample sitting...People can spread out from the front room to the second living area to the dining area, outside patio and stretch to the sunroom as well. Outside has lovely white lights as well. It's such a girls house, with every detail thought of! Wall paper, pink rooms, and renaissance and Parisian style art. I am a Corporate Flight Attendant and fly all over the world, I decorate with this inspirations and objects I pick up while flying. I've been renting as a bed and breakfast and doing side parties for years and finally listing it. Everyone loves this house! It's a real dollhouse cottage perfect for your shower, bachelorette party, girl party or romantic cottage style get away. Serious inquiries only please. I get inundated everyday. Thank you!